Nioxin Cleanser System 4 150ml – Remove the daily build up from your hair with this volumising cleanser that leaves your hair looking thicker. 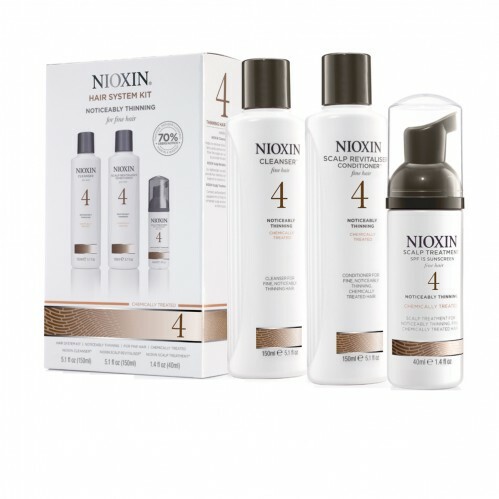 Nioxin Scalp Revitaliser System 4 150ml – Provide your hair with resilience and restore its moisture balance with this lightweight conditioner. It also contains SPF 15 sunscreen to help protect the scalp skin for noticeably thinning hair..
Nioxin Scalp Treatment System 4 70ml – Containing antioxidants and botanicals this leave in conditioner refreshes your scalp enviroment. Get the thick hair you want with Nioxin Trial Kit System 4 that contains BioAMP that increases the fullness of each hair strand and helps strengthen it against damage, Scalp Access Delivery System that clears away residue and build leaving your scalp clean and refreshed as well as providing protection from the sun, and Glyco-Shield that helps provide protection and moisture balance to colour treated hair.